In Haarlem, Netherlands, Gijs Spaans operates a CrossFit affiliate right next door to a Globo Gym. In fact, the two businesses share a wall. That’s because Spaans used to own the gym next door. “I took the best 500 meters of the gym and sold the rest,” he says with a wide smile. In the space where he used to teach spin classes, Spaans opened CrossFit Spaarne, which after three weeks had 90 members. He found CrossFit about a year-and-a-half ago. “I was growing out of it,” Spaans says of his former business, though he emphasizes the business he left is not a rival. ’cause some of these people are working out and getting exercise done, which they would have never done. These guys are not our enemies,” he says. As for his new business, everything is falling into place, Spaans explains. Additional reading: California Via Europe? by Blair Morrison, published May 6, 2010. Fourteen years ago, Robin Edds had bariatric surgery. She went from 330 lb. to 150 lb. Life, however, wasn’t much better. 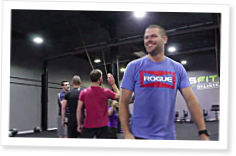 CrossFit Leicester in Leicester, U.K., hasn’t been around long, but you wouldn’t know it based on the commitment of its coaches and the camaraderie of its community.